There are ways that you can help the Voices for Children (VFC) and Guardian ad Litem (GAL) throughout the year. 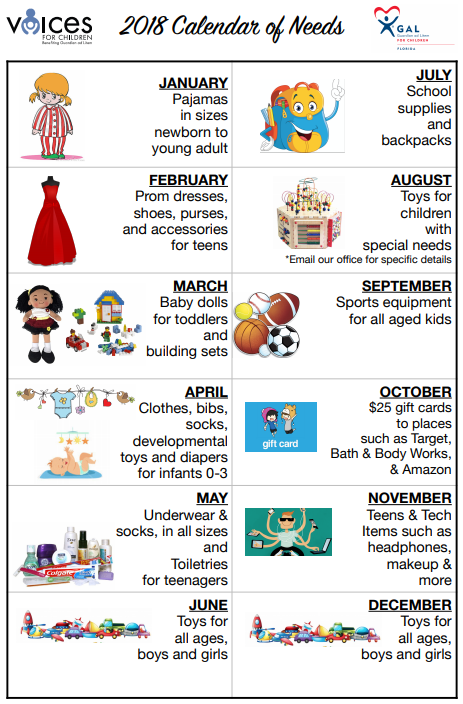 You can donate items directly to the children that we serve with the help of the Calendar of Needs. Simply host a collection throughout the month and then drop off items to the VFC office between 9 a.m. and 2 p.m. on the last work day of the month (March’s drop off day will be Friday, March 30th). The donations will be available at the GAL office for the kids that need them.